There were very few projects the 7499th Group and all three of its squadrons directly supported. Each squadron had its own unique functions. But supporting the new Matador and Mace tactical guided missiles in Europe was one they could share (even if each wasn't supposed to know what the others were doing). The 7405th and 7406th Squadrons each flew a special kind of airborne collection mission. It was not traditional photo collection, and it certainly wasn't signals intelligence. It was imagery of a special sort, designed to support a tactical missile guidance system called the Automatic Terrain Recognition and Navigation (ATRAN) system, and the time frame was 1955-56. ATRAN was meant for use in the TM-61B version of the Martin Matador air-breathing winged missile (what we would call a cruise missile today). In the early 1950s the Air Force had fielded two versions of the Matador (the TM-61A and C) which depended upon positive guidance control by radar-directed ground controllers. The maximum range for those systems was about 200 miles, and they would be very susceptible to enemy countermeasures. So ATRAN was to be employed in the TM-61B version to correct those problems. The TM-61B was to evolve into the TM-76A Mace missile with a much-improved performance; this ATRAN-equipped Mace version was to stay in the Air Force inventory in Europe until September 1966. How to get the required ground imagery to create the matching film? The main area of employment of these missiles was to be Western Europe, so collection would be in that arena. The hope was that reconnaissance missions and other intelligence sources would provide enough accurate data to enable good "sand table" models showing terrain and habitations, thus allowing good film strips to be created and uploaded into the missiles. Aerial reconnaissance missions were an obvious means of collecting up-to-date data, and the Air Force had just created units that could do this task. Headquarters US Air Forces in Europe (USAFE) at Wiesbaden, Germany, activated the 7499th Support Group at Wiesbaden in mid-1955. The 7499th Group would run its ATRAN missions under the project name "Aunt Sue." Two of its squadrons would have the ATRAN task among others. The 7405th Support Squadron would collect ATRAN material using a Douglas C-54D under Project "Lulu Belle." The 7406th Support Squadron would use three Boeing RB-50Ds under Project "Half Track." Each of these aircraft would use specialized radar scope imagery, coupled with simultaneous regular photography, to get the required information. Each was limited to flying its missions over friendly-controlled territory, but this would enable the best possible accuracy for that part of a missile's flight path from launch until crossing into hostile territory. Other sources for the "sand table" would have to suffice where reconnaissance couldn't be done. There is speculation as to why two different platforms were used for this project. The C-54 would be a very logical choice for ATRAN missions covering terrain underneath and near the air corridors to Berlin. Aircraft flying in the Berlin Air Corridors were required to land at a West Berlin airfield (usually Tempelhof for US aircraft) and would be subject to Soviet observation and probable complaints if they were perceived to be other than transport aircraft. Thus the RB-50s were disqualified on this ground as well as that the aircraft were too large for the Tempelhof runways. Available photographs of the project C-54 show few protuberances to draw suspicion to it. 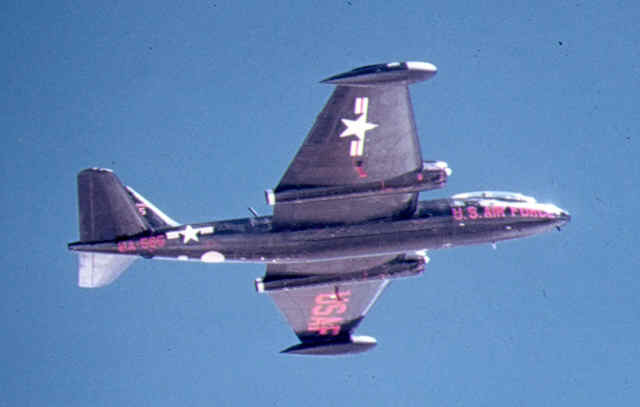 The RB-50 might have been the best available choice for the missions over Western Europe because it could carry a heavier load of special equipment. The Lulu Belle C-54 (42-72684) that was to be used for ATRAN was also fitted for two other special tasks: an early-generation infrared system called a terrain reconnaissance device (TRD) and also an APS-27 moving target indicator (MTI). Those systems were installed under Big Safari, a special Air Force program office which worked closely with Convair at Fort Worth, Texas, and with Goodyear at Akron, Ohio, which installed the ATRAN system (the modified navigation radar and camera). All this occurred in 1955, and the C-54 arrived at Wiesbaden Air Base in December that year. In the first half of 1956 Lulu Belle flew at least twenty ATRAN missions. The quality of the flight lines produced was unacceptable at first, but it gradually improved as equipment became more reliable and crews more proficient. However, the ATRAN portion of Lulu Belle was halted in the fall of 1956. A total of 23 more missions had been flown by that time. The RB-50D aircraft to be used in the Project Half Track part of ATRAN would seem an unlikely choice for low level intelligence gathering missions. Flying the huge modified bombers out of Rhein-Main Air Base in Frankfurt, Germany, were crews of the 7406th Support Squadron. The 7406th was activated in May 1955 and was to have two missions, both with RB-50s. One would be communications intelligence collection, with the RB-50G version, and the other was to be ATRAN route collection, with three RB-50Ds. The ATRAN aircraft were modified by Goodyear at Akron, Ohio, before being assigned to the 7406th. Problems at Goodyear delayed the arrival of the three aircraft (serial numbers 48-107, 49-307, and 49-312) until spring 1956. Finally all three were available, and the first ATRAN mission was flown 1 June 1956. The 7406th Support Squadron memoirs describe the missions: "The Half Track RB-50D aircraft had two pilots (AC & copilot), two navigators (radar & radio), a flight engineer, a radio operator, two scanners/gunners (the aircraft had two upper & two lower gun turrets), and a tail gunner... The "Half-Track" back-end crew consisted of two persons that were not members of the 7406th. These two sat in the scanner/gunner compartment, aft of the bomb bays, during take off & landings. During missions these two sat on a platform in the forward bomb bay... Low level flights commencing from points in Western Germany were flown to the East German border"... (They would fly as) "straight a line as possible from middle Germany to the East/West German border at 500ft and 1000ft absolute altitude, and pull up at the border. At times an aircraft would return to Rhein-Main with tree limbs wrapped around the aircraft tail skid." The 7406th flew about seven Half Track missions per week at first. Between July and September 1956, 52 more missions were flown. But then came the word that on 19 October 1956 the squadron was to be relieved of the Half Track ATRAN mission. Like the Lulu Belle C-54, the Half Track RB-50s were judged not able to produce the quality information needed. "The equipment on the aircraft was not able to do the mission within specified tolerances. The same job would be done by synthetic methods." The 7499th Group history has this as the epitaph: "The ATRAN phase of Project Lulu Belle and its sister project Half Track fell by the wayside due to equipment inability to produce as satisfactory a product as the Research and Development people had hoped possible. It appeared to personnel of this organization that the project cancellation was premature. However, we have only a partial view of the guidance project as it exists in the Air Force." Some 7406th people recall: "Apparently, the entire program was compromised with the publication of an Aviation Week magazine article in August of 1956. All Half Track missions stopped immediately after publication of the highly descriptive article." Research into Aviation Week magazines for 1956 and 1957 has failed to find the incriminating article. As the 7499th Historian, I would like anyone with knowledge of this article, or anything else about either Lulu Belle or Half Track missions, to contact me. So what was the 7407th's part in this story? It came in 1958, when two B-57Bs (52-1565 and 53-3860) were transferred (under Project Hygiene) to the 7407th from the 38th Bomb Wing, Laon AB, France. One was fitted with the "shanicle" (ATRAN) guidance system, and the other with the positive ground control (MSQ-1) guidance system, thus simulating both systems then in use on the missiles. They were stationed at Rhein-Main but frequently flew from Sembach AB, the home of the new 38th Tactical Missile Wing. Until they were transferred to the US in 1960 they flew over 200 missions (by rough estimate), testing the systems and simulating missile launches. They often deployed to Wheelus AB, Libya, where the missile crews conducted actual launches. In the fall of 1958 they worked out of Wheelus as part of Operation Marblehead, a large-scale exercise involving all of the missile wing squadrons.During these two years the 7407th also used the two B-57Bs for transition training for the unit's RB-57Ds. After 1960 the 7407th provided periodic maintenance support to two other B-57s that had been permanently assigned to Sembach. Thus all three squadrons supported these early ground-launched cruise missiles. You can read about ATRAN and the Matador and Mace missiles in a newly published book, "The U.S. Air Force Tactical Missiles 1949-1969: The Pioneers." The authors, George Mindling and Robert Bolton, have used our material in telling their story. As stated above, please contact me with any info you might have on these missile support projects.